Go see it if you can get to a theater, or call it up on your cable TV. Even though this documentary was inexplicably not included in the short list for Academy Awards, I’m certain that this film will be important in college classrooms for many years to come. In 2011, the NYPD stopped and frisked people 685,724 times, and fully 87% of those searches involved blacks or Latinos, many of them young men, according to the New York Civil Liberties Union. There is a groundswell of protest growing against these racist police practices, yet too often, the voices of those most affected by it are not included in the discussion. Until now. By his count, before his 18th birthday, Tyquan had been unjustifiably stopped by the police more than 60 times. His hope in sharing his story is that this will be a bigger project to examine more closely the impact of the stop-and-frisk policy on actual human beings. In Part 1 of this post, I wrote about the similarities between the police practice of racial profiling in France and the U.S., emphasizing that different constructs of race in both countries, nonetheless, produce the same outcome, again racial profiling. Though discredited by science, race as inherent inferiority and superiority has been central to the socio-economic organization of the U.S. The four horsemen of racial inequality—education, incarceration, health, and wealth—are living legacies of race-making in the U.S. and so is racial profiling. “There’s a long history in this country of African-Americans and Latinos being stopped by law enforcement disproportionately. That’s just a fact,” said President Obama in 2009 after the profiling and arrest of Harvard Professor Henry Louis Gates, Jr.
And the stop-and-frisk of innocent, predominately Black and Latino New Yorkers is also a fact, numbering over 4 million by some estimates since 2002. The experiences of New York University Professor Manthia Diawara illustrates how racial profiling cuts across social class. Professor Diawara was stopped and humiliated by the police while riding in a taxi, not in the U.S. but Paris, France. Stop-and-frisk laws in the US are not necessarily illegal, but the lawsuit against the New York Police Department’s use of this tactic challenges its legality. 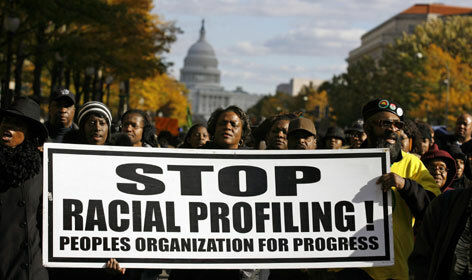 Similarly, stop-and-searches in France are not illegal, but racial profiling is. It should not be forgotten that racial profiling led to the 2005 revolts in France, following the deaths of 17 year old Zyed Benna and 15 year old Bouna Traoré who mistook a transformer in a power station as a safe haven and were horribly electrocuted when fleeing from a police control. Similarly, Trayvon Martin and countless others in the U.S. have been stopped for what they looked like not for what they did. Over the past 15 years, New York City has become the marijuana arrest capital of the world due to a policing policy that functions to institutionalize racism. More than 84 percent of those arrested were people of color – even though young whites use marijuana at higher rates. Research by CUNY Professor Harry Levine finds a systematic, racial bias (pdf) to the NYPD’s approach to policing marijuana. While possession of a small amount of marijuana (less than 25 grams) has been decriminalized in New York State since 1977, more than 50,000 people were arrested in New York City for “possessing or burning marijuana in public view” in 2011 (largely the result of the City’s controversial stop-and-frisk practices that recorded almost 700,000 stop-and-frisks last year alone). A large majority of these arrests are the result of illegal searches, false charges, and entrapment. Several organizations in New York City such as the Drug Policy Alliance, the Institute for Juvenile Justice Reform and Alternatives (IJJRA) and VOCAL New York, are working to end these racially biased and illegal marijuana arrests. The main way these organizations are doing this now is through a piece of legislation currently in the NY State legislature. Conservative media pundits like Bill O’Reilly argue that further decriminalizing marijuana will lead to an increase in street crime (as he did on air this morning on Fox & Friends or as ), but there’s no evidence for such a claim. In fact, a recent New York Times piece clarifies this by noting that crime has also dropped in jurisdictions that don’t use NYC’s aggressive, racist stop-and-frisk policing strategy. If you’d like to take action to stop this form of institutional racism, you can sign this online petition. 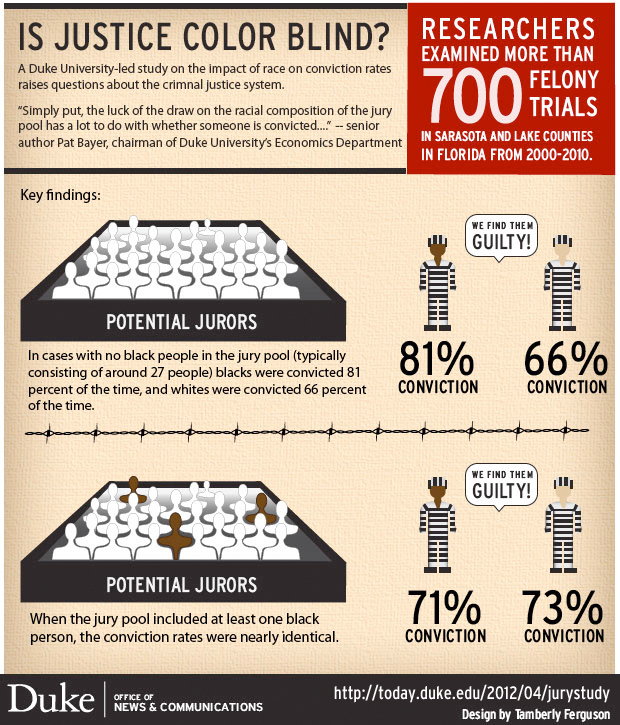 Juries formed from all-white jury pools in Florida convicted black defendants 16 percent more often than white defendants, a gap that was nearly eliminated when at least one member of the jury pool was black, according to a Duke University-led study. The researchers examined more than 700 non-capital felony criminal cases in Sarasota and Lake counties from 2000-2010 and looked at the effects of the age, race and gender of jury pools on conviction rates. There is a nice graphic of the Duke research results here. At least in constitutional words and theory that is. In fact, as this study suggests, the “justice” system’s practices periodically follow the path of individual and institutionalized racism rather than the path of a trial by a fair and impartial jury of one’s peers. In these Florida counties 40 percent of the jury pools had no black members, and most of the other pools had only one or two. And there is much other recent evidence of systemic racism in our criminal “justice” system as well, as we have previously discussed here. For centuries, a great many African Americans have not gotten the benefit of this 6th amendment’s grand and egalitarian language. It is also interesting which amendments in the Bill of Rights to the U.S. Constitution get the most praise, publicity and attention these days in the United States. This is not one of them. If you want to see justice for Trayvon Martin, you can sign a petition here. At the crime scene, the Sanford, Florida police botched their questioning of Zimmerman, refused to take the full statements of witnesses, and pressured neighbors to side with the shooter’s claim of self-defense. Sanford’s police department has a history of failing to hold perpetrators accountable for violent acts against Black individuals. The police misconduct in Trayvon’s case exemplifies the department’s systemic mishandling of investigations involving violence against Black victims. And now the State Attorney’s office has rubber-stamped the Sanford police’s non-investigation, claiming that there is not enough evidence to support even a manslaughter conviction for Trayvon’s senseless and entirely avoidable death.